For this month's lecture we welcomed Mike Frost who is Director of the British Astronomical Society's Historical Section and a founder member of the Society for the History of Astronomy. With such credentials we were eager to hear his talk "A Warwickshire Eclipse" which was all about historical eclipses of the Sun visible from Warwickshire. During one of his many research trips Mike Frost found a map predicting a solar eclipse track that had been drawn by the polymath Henry Beighton in the archives at Arbury Hall, Nuneaton. The eclipse occurred on the afternoon of February 18th 1736 or February 18th 1737 or March 1st 1737 depending on what calendar you followed at the time. This rather confusing set of dates was due to some people starting their year on 1st January and others on 25th March, which led to February 18th falling in 1736 or 1737. The reason for the date being the 1st March rather than February 18th was that some countries had adopted the Gregorian calendar (which we still use today in the UK) much earlier than Great Britain and its colonies. By the time that Britain changed from the Julian calendar over to the Gregorian calendar there was an eleven day discrepancy between the two systems. On the day of the eclipse that crossed Warwickshire the Moon only covered most of the Sun leaving a crescent shape at the time of maximum coverage. However, further north, in places like Edinburgh the Moon would have moved more centrally across the solar disc and at the time of maximum coverage a bright ring was left around the Moon. This configuration is known as an annular eclipse as "annulus" in Latin means "little ring". Two decades earlier on May 3rd 1715 central England did witness a total solar eclipse early in the morning. The second Astronomer Royal, Edmond Halley, drew a predictive map of the path of the Moon's shadow from Cornwall to Lincolnshire and Norfolk. 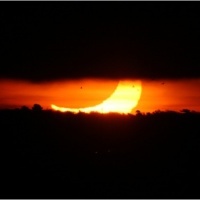 He observed this event from London where the Sun was totally obscured by the Moon for 3 minutes and 33 seconds. He was able to predict the eclipse times to within an accuracy of 4 minutes and his predictive map was only about 30km off the actual observed path. To his credit he corrected his map to show a more accurate track and also added a verbal description of the event underneath his diagram. The first two-thirds of the 18th Century saw a cluster of eclipses visible from the UK. There were two total solar eclipses in 1715 and 1724 and then three annular eclipses in 1737, 1748 and 1764. Following these events there were no more opportunities to view any type of eclipse from the UK until the 1920s and the next total eclipse does not occur until September 2090. However, if you are prepared to travel you can, like Mike Frost, make sure you are in the right place at the right time to witness the magical spectacle that is a total solar eclipse. He is planning to be in the far north of Australia on November 13th this year when, given clear skies, he will witness his 8th solar eclipse event.